Out of everything on this list, Cowboy Bebop is without a doubt the most perfect. It’s a great show no matter how you look at it; it’s consistently cool, the main cast is complex and memorable, its existentialist themes are fascinating to dig into, the aesthetic still holds up nearly 20 years later, and the soundtrack is one of the best in all of anime. I like every single episode of Bebop to some degree, from the dark and thoughtful Ballad of Fallen Angels to the goofy Mushroom Samba. Even the weakest episodes are still good, just not as good as the high points. Ballad of Fallen Angels is especially noteworthy as one of the best single anime episodes I’ve ever seen, telling a perfect standalone story of a former gangster’s past catching up with him. The beauty of Bebop is that it can tell archetypal stories like that so well that they feel original and thought provoking. Everything about Bebop works to enhance the final product and is the result of a lot of talented creators working together perfectly-Shinichiro Watanabe directing, Keiko Nobumoto writing, Yoko Kanno doing the score, and a talented animation staff at Sunrise that later went on to found Studio Bones. Everyone involved was extremely talented and it shows in the final product. Bebop is polished across the board and stands as one of the best anime I’ve ever seen. The only reason it’s not higher on this list is because the next five shows match my tastes a little bit more. Kara no Kyoukai is a difficult anime to describe. On the surface, its a series of supernatural murder mysteries with the occasional action scene, but there’s so much more to it than that. The out of order timeline, constantly dark tone, and dense philosophizing mean it’s not an easy watch, but Kara no Kyoukai is infinitely rewarding by the end. 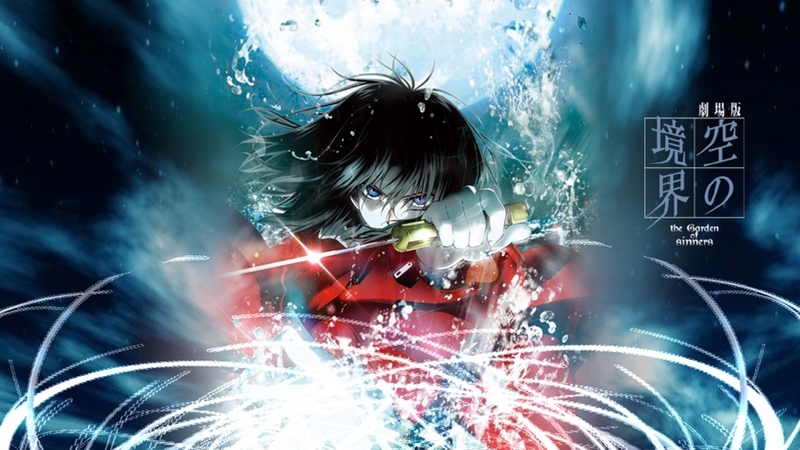 Properly explaining everything would practically require a dissertation, but the real core of Kara no Kyoukai is a very strange love story between two very strange people-Shiki, the murderer who hasn’t yet killed, and Kokuto, a man so ordinary it makes him extraordinary. Their story is the heart behind every film, and manages to connect to all of the disparate philosophizing throughout the story. What holds all of this together is a masterfully executed atmosphere, courtesy of Ufotable’s gorgeous visuals and Yuki Kajiura’s beautiful soundtrack. Those combine to create an otherworldly atmosphere that makes even the stranger concepts easy accept. Few anime have ever combined writing, direction, visuals, and music to the degree Kara no Kyoukai has. The four combine to create a final product that’s greater than the sum of its parts. No matter how much I say about it, I always feel like I can’t do Kara no Kyoukai justice. It’s a complicated work, but its easily Kinoko Nasu’s best, and gives you a one of a kind experience. It may not be an easy watch, but it’s well worth it none the less. Black Lagoon was pretty much guaranteed to be my type of show from the start. It’s particular brand of silly, Tarantino-esque violence is exactly my thing, doubly so because of how self-aware the show it. It’s obviously aware that it’s ridiculous (how could you not be when you have moments like this and this) but commits to it anyway, making for a really fun ride. That said, the action isn’t why its so high on this list. I went in expecting that kind of action, but what surprised me and earned Black Lagoon its spot here is the character writing. Rock and Revy seem like pretty standard characters at first-the meek nice guy and the tough action girl, respectively-but are actually far more than that. This is most clearly shown in their argument in episode seven of season one. In the space of one scene you see Rock finally stand up for himself, Revy reveal just how bitter her life has made her, and both of them finally speak to each other like equals. It’s one of my favorite moments in anime for how much it develops both of them and makes you feel really sorry for Revy. She’s not just some badass fighter, she’s someone who’s hard life has left her bitter and violent. Rock represents the lifestyle she both hates and envies, which is why she originally wanted him to join the Lagoon Company, but also why she always seemed to hate him. Their relationship is a fascinating one, especially as it develops further in season two and the OVAs, and is what puts Black Lagoon this high on the list. Steins;Gate is an interesting show. It starts out as a slice of life comedy with some sci-fi elements but becomes an emotional sci-fi thriller at the halfway point. That structure sounds like it wouldn’t work at all, but the two parts are both excellent on their own and combine to form an amazing show. The first half is full of hilarious banter between the cast, while simultaneously setting up major plot points and relationships that lead to some great payoff in the second half. By the end, there wasn’t a single character I wasn’t attached to and every one of them had gotten an arc with great dramatic payoff that never felt like it distracted from the main story. 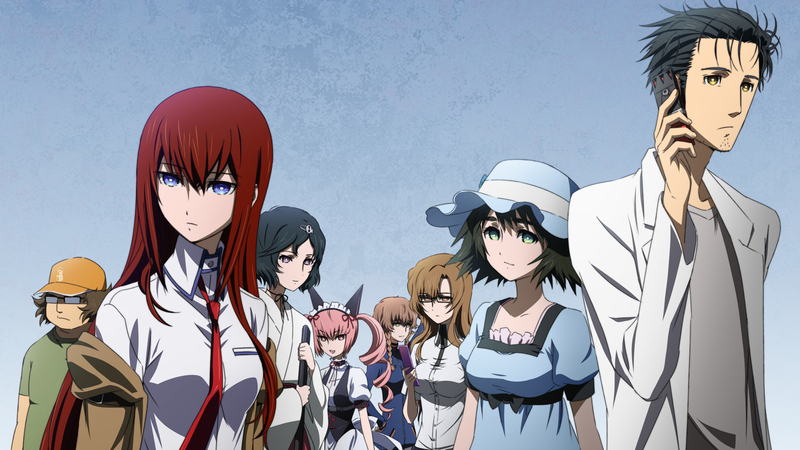 Like Spice and Wolf, I would watch Steins;Gate just to see more of these characters hanging out and being themselves; they’re that fun to be around. The story is a slow build at first, but this pays off once the time travel aspect really kicks in. Most time travel stories run into paradoxes or inconsistencies when you think about it too much, but Steins;Gate is so meticulous about setting up its time travel and the rules behind it that it holds together no matter how you look at it. Really though, Steins;Gate isn’t a show about time travel as much as it’s a show about how accidentally inventing travel affects the cast. Once it starts digging into that, it’s constantly engaging and emotional and builds to one of the best endings of any anime I’ve seen. Steins;Gate is nothing short of amazing. I was a little worried going into Brotherhood. The original FMA was great, even with the sub-par ending and Brotherhood had a lot to live up to. Thankfully, Brotherhood not only lives up to its predecessor, it comes out as the better version. After a somewhat rushed beginning, Brotherhood takes off and never looked back. Unlike the original, Brotherhood is fast paced, but never comes off as rushed. It always has a goal and it never gets lost on the way there. Nearly everything I like about the original is also in Brotherhood, along with so much more. The plot is just as interesting as the original, but much larger in scale. No matter how big you think the plots and conspiracies in Brotherhood are, they’re still bigger. This lets it produce some shocking twists that even outstrip what the original had to offer without ever losing the show’s grounding. Similarly, the core cast gets even bigger. While the original FMA focused more on the Elric brothers, Brotherhood gives every character enough screen time and characterization that they could practically star in their own anime. This is backed by some really stellar action. If the original FMA is a drama that mixed in some action, Brotherhood is straight up shounen action/adventure. There are pretty frequent fights that are almost always exciting and memorable. The animation and choreography are much improved from the original FMA to the point where the later ones are some of the best fights you’ll see in anime. All of this leads to a climax that’s massive in scale, but somehow manages to balance every plot point, character, and fight without losing anything in the mix or turning into a complete mess. Brotherhood is a stellar anime that easily earns its place this high on the list. Topping FMA isn’t easy, but Brotherhood pulled it off. In some ways, One Piece is the most flawed anime here. The pacing is slow, the animation rarely rises above mediocre, and not every arc showcases its best content. That said, I can’t imagine putting any other anime at the top of this list. I’ve always liked shounen (it’s how I got into anime, after all) and One Piece is the perfect shounen. The cast has grown a lot over the 700+ episodes, but it never loses sight of the core cast of likable and surprisingly complex characters. The story continually gets bigger and bigger, but it never gets so big that it loses itself and constantly stays interesting. The scale of the fights is constantly growing, but never in a way that invalidates the earlier content, an amazing feat for such a long anime that seems on track to top 1000 episodes. Beneath all of that, there’s a core cast of fun, goofy characters, every one of whom I like. They may seem like a typical shounen oddball cast but every one of them, from the simple minded captain to the perverted skeleton to the cute talking reindeer, has a surprising amount of depth that you rarely see in this kind of shounen. Once you learn their backstories, its almost impossible to not get attached to these goofy pirates. Every one of them has an emotionally powerful backstory that develops them beyond how they appear on the surface. I’ve cried more watching One Piece than any other anime to date, and that’s not just because it has more episodes than any other I’ve seen. It really understands how to use this investment, too. Fights all have tangible stakes for characters you’re already invested in. It’s more than a chance to show off cool abilities (although there’s plenty of that); there are real stakes for the characters involved. One Piece has virtually everything I look for in a story. It has a complex and always growing world, the plot is interesting and unpredictable, the characters are likable and interesting, the action is great (even with the mediocre animation), it can make me both laugh and cry in the span of a single episode, it’s dramatic resolution is always satisfying and emotionally charged, and it can even be surprisingly thought provoking. In short, it’s the perfect anime for me. And that’s the list. If any of these caught your eye, I highly recommend checking them out. So now I leave it to you. Did you like the list? Are there any anime you think I would like based on this list? Feel free to respond in a comment or just share your own favorite anime. It’s been a fun year. Thank you to everyone who’s liked reading my thoughts on anime. Watch Gintama maybe, if you haven’t yet. While I don’t know if it would have made it into one of your top 5. I can see it at least landing a spot in our top 15 list. it’s that or maybe I’m just being biased over my favorite anime..